“Million Man March,” Histories of the National Mall, accessed April 23, 2019, http://mallhistory.org/items/show/428. 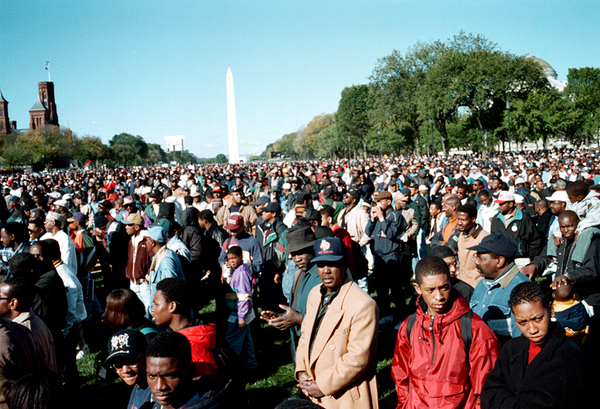 This march on the National Mall for African American civil rights was proposed by Louis Farrakhan and organized with the support of the National African American Leadership Summit, the Nation of Islam, and various civil rights organizations. The March organizers wanted to challenge what they perceived as growing racism in the United States, particularly in government policy, and to present a new definition of black manhood to the nation. The main focus of the event was sessions held on a stage near the west front of the Capitol. Estimates for attendance vary, ranging from 400,000 to 870,000 people. Joacim Osterstam, Flickr.com. View original.